Ute Zimmermann came to the Gowanus neighborhood in 2011 for a lovely loft apartment, but she stayed for the toxic sludge. After falling in love with the neighborhood’s peculiar charm — nowhere else in the city can you watch the sunset as you walk over a canal, looking down to see, in her words, “poop foam flowing underneath you,” — Zimmermann saw the neighborhood grow in popularity with tourists as well. So in October 2015, she opened a pop-up shop with local art and souvenirs, celebrating the unlikely appeal of the smelly canal and its gritty surroundings. Zimmermann planned to run the shop for three months as an arts project. 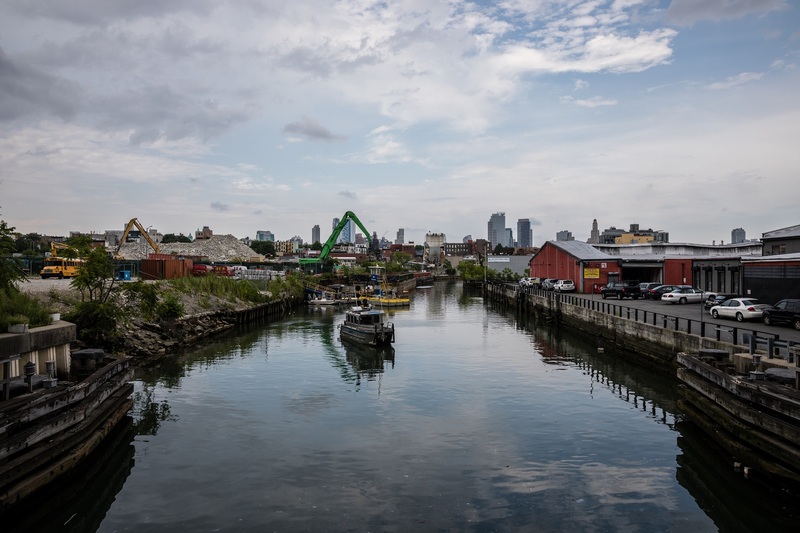 Later this year, the Gowanus Souvenir Shop, which Zimmermann describes on the store’s website as “part small town tourist stand, curio shop, antique books and map store rolled into one,” will mark its third anniversary. Walking by the storefront at 567 Union S., visitors can pop their head into a painted photo board to pose as the Creature from the Black Lagoon. The B-movie horror icon is a theme in the shop, including T-shirts, “It Came From the Gowanus Canal” comic books and two posters Zimmermann commissioned for the shop. The canal, polluted by long-gone industrial plants and current sewage overflow, is a Superfund site with a cleanup in progress. But the neighborhood’s accretion of quirky businesses and artists, which had moved there over the years for cheaper rent, created a critical mass that has in recent years turned it into a kind of urban amusement park and events district that is now attracting large real-estate investment. Under a plan released by the city this week — it’s the precursor to a rezoning proposal, which is expected this winter — the neighborhood would become much more densely populated, with new buildings up to 17 stories in some areas. Acknowledging that “people like me moving in” is part of gentrification, Zimmermann wants the neighborhood to keep its peculiar character, and she tries to preserve its history at the shop. It includes a small museum of objects found in the neighborhood. Zimmermann also collects stories of the neighborhood’s past, some of which are probably … not strictly true. Her favorite customers are old-timers who tell her about the days when kids didn’t play on President Street because the mafia operated there, or how there used to be so many rats by the canal that residents would shut their windows to keep the rodents from jumping into their homes. She describes her business as a way to benefit the neighborhood’s creative economy by showcasing the work of local artists and helping make them money. She works with about 60 artists and designers whose work is in the store, she said, much of it designed specifically for the store. Zimmermann’s time in business has taught her a couple of things she wished she had known when starting. “Don’t ever pay for advertising,” she said, singling out a bad experience with Yelp. “I gave them 300 bucks a month for four clicks.” She has found more success in attracting journalism, she said, from outlets including the German newspaper Die Zeit, a Japanese travel magazine, and in-flight magazines for Air France and United Airlines. Zimmermann also gets traffic from word of mouth and through posting on Instagram. Her business is also helped by having a good relationship with her landlords, whose home is on the same lot. Their kids “love coming by the shop to check out the new candy I have,” she said. A heartfelt letter from one of the children hangs by the cash register at the shop. Zimmermann also credits her business partners. Joel Beck, an artist, co-founded the business with her and renovated its current location. Zimmermann has partnered with Diana Ho, an artist who first worked for her as a shopkeeper. Now Ho rents a fourth of the space for her own business, an arts-and-gifts shop called From Here to Sunday. She also splits shopkeeping hours with Zimmermann, and both sell each other’s work when the other isn’t in the shop. “We help each other out,” she said.